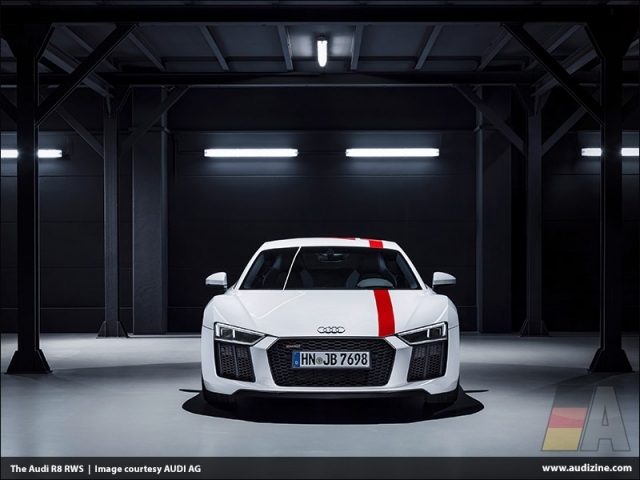 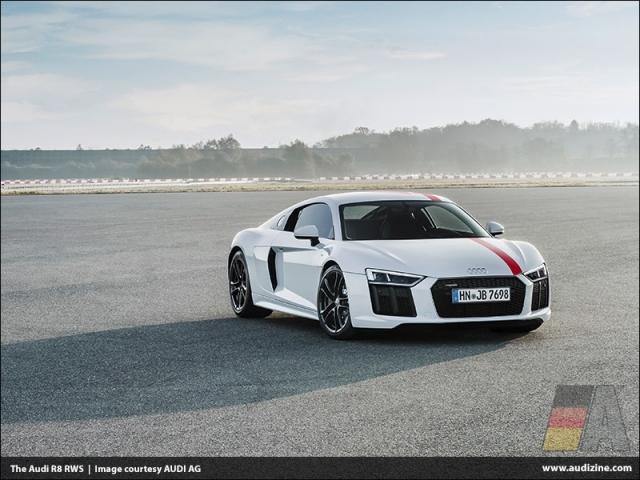 Stephan Winkelmann, Managing Director Audi Sport GmbH: "R8 V10 RWS successfully brings driving concept of our R8 LMS racing car to the streets"
The Audi Sport GmbH is extending its R8 model series to include a new derivative with rear-wheel drive. 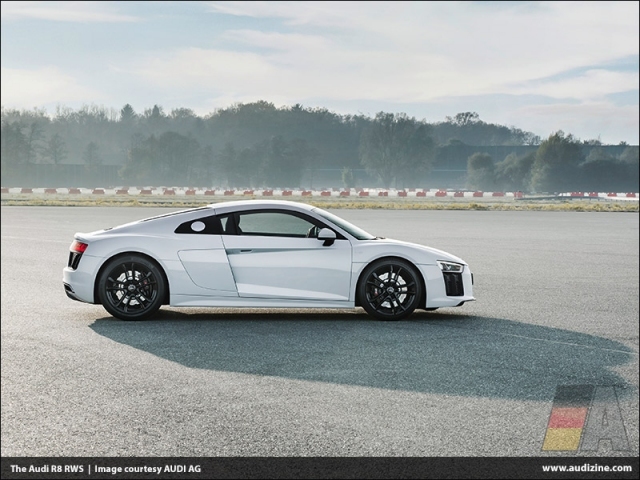 The Audi R8 V10 RWS (Combined fuel consumption in l/100 km: 12.6 - 12.4, combined CO2 emissions in g/km: 286 - 283**) comes in a limited series of 999 units with both Coupé and Spyder variants. 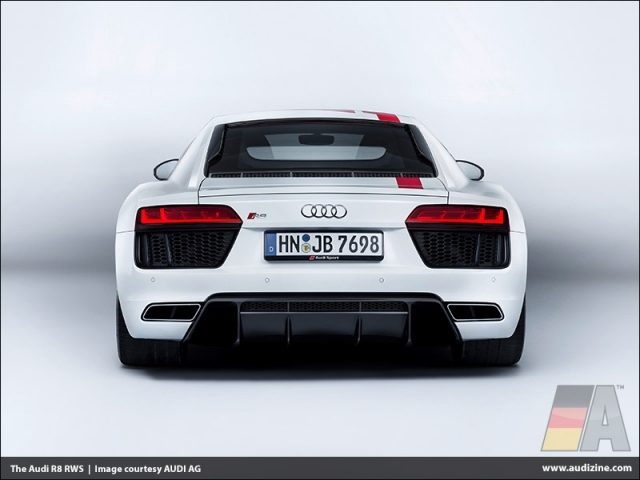 It will be rear-driven (Rear Wheel Series) and be built exclusively by hand at the Böllinger Höfe R8 factory. 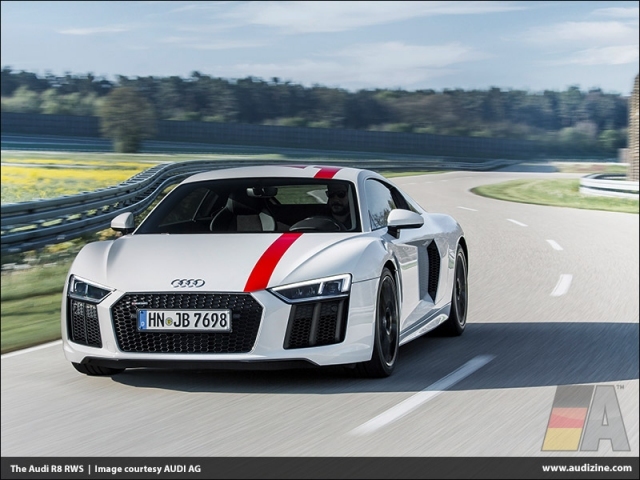 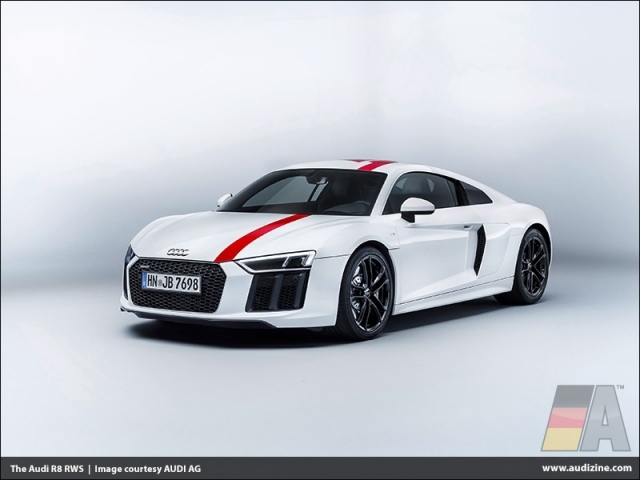 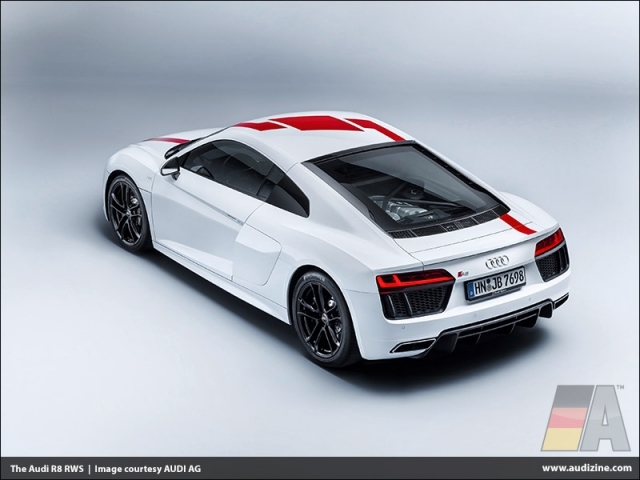 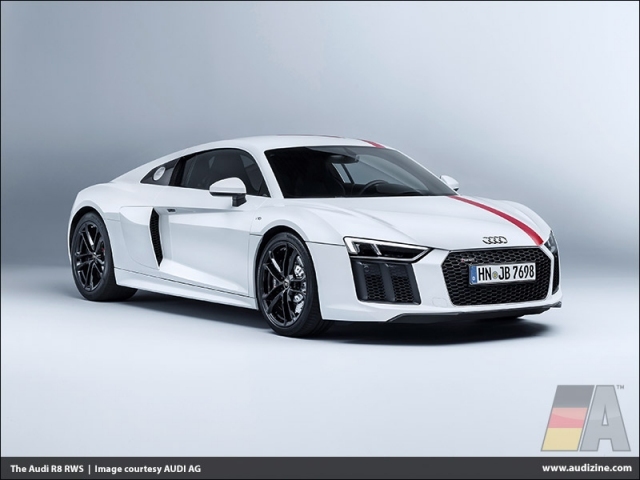 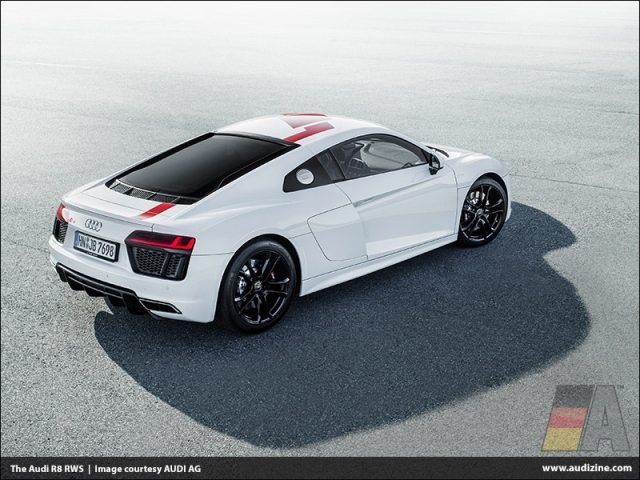 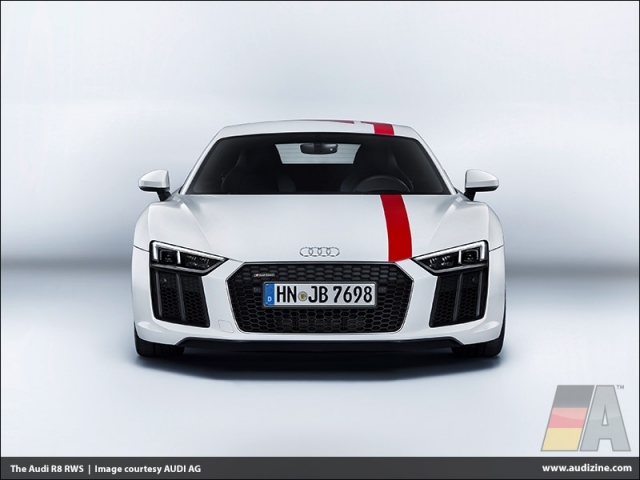 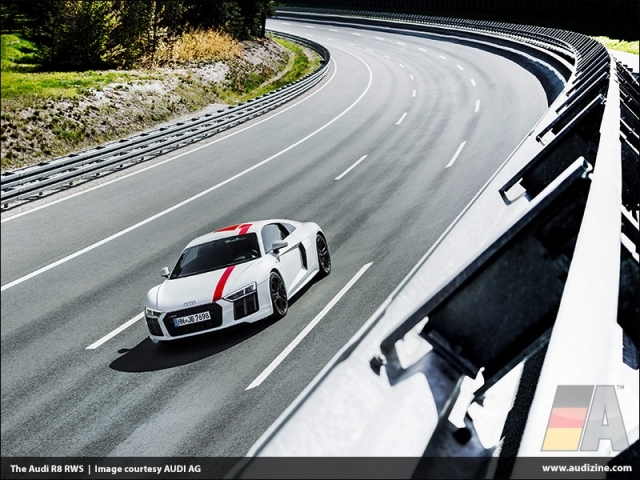 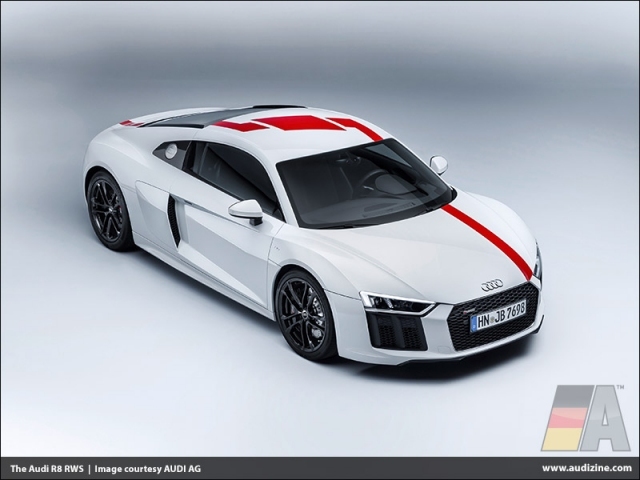 "The R8 V10 RWS is made for purists," said Stephan Winkelmann, CEO of Audi Sport GmbH. 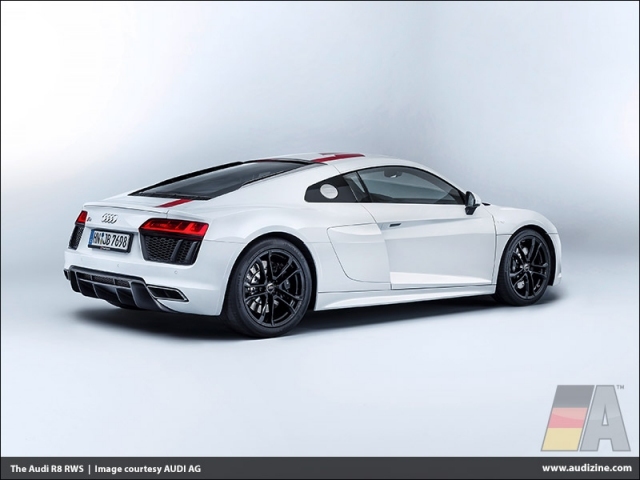 "A limited-edition special model for customers with an appreciation for essential driving enjoyment, the R8 V10 RWS is an absolutely exclusive offer. 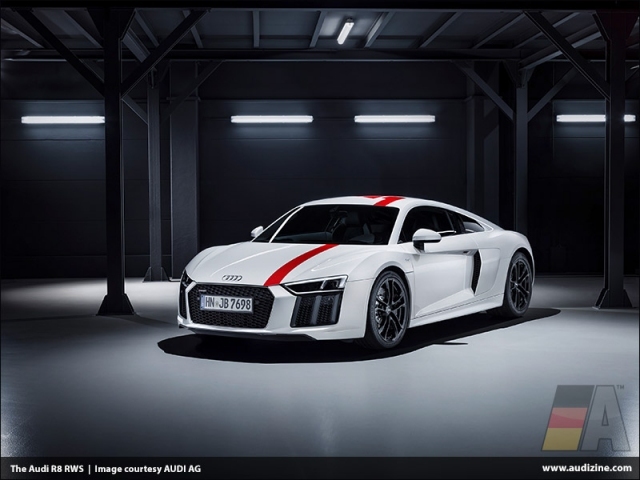 With its mid-mounted V10 engine and rear-wheel drive, it successfully brings the driving concept of our R8 LMS racing car to the streets." 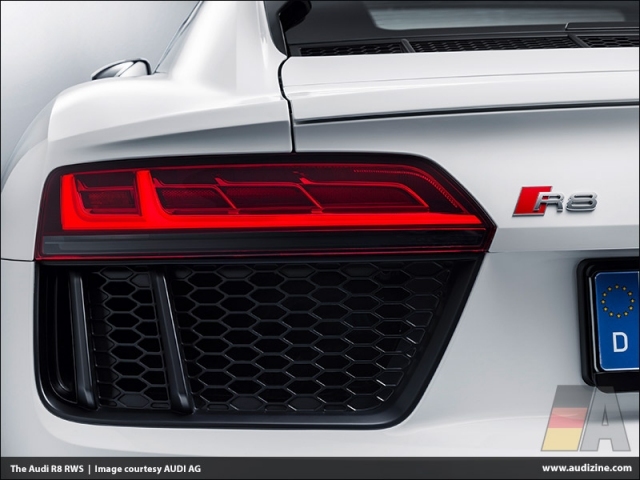 The puristic character of the new R8 variant is underscored by the matt black grille of the Singleframe and the matt black air apertures at the front and rear of the car. 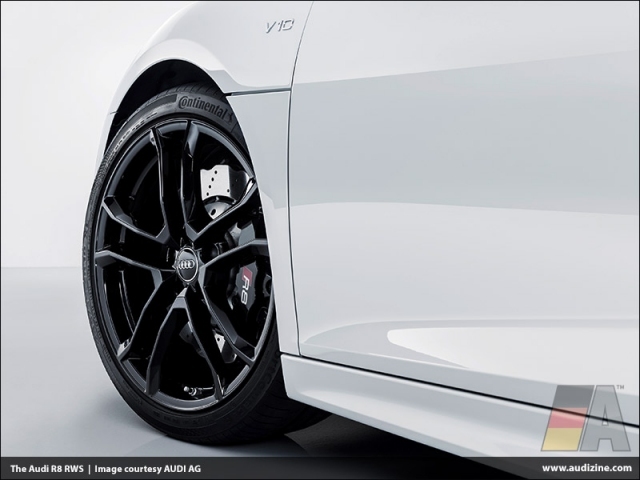 The upper sideblade (of the Coupé) is finished in gloss black, the lower blade in the body color. 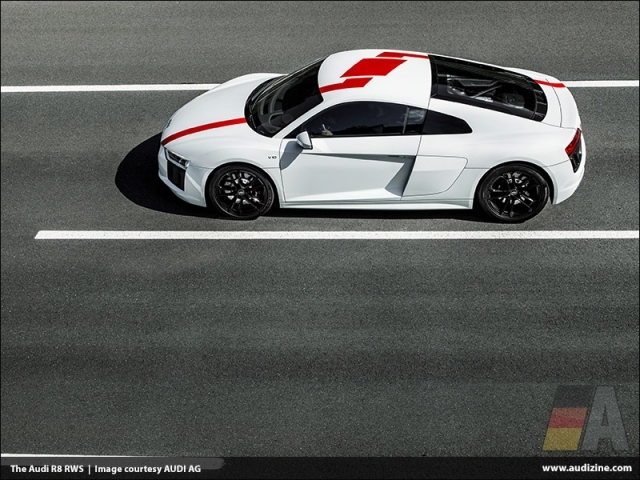 Similar to the R8 LMS GT 4, the Coupé is available with an optional red film running over the front bonnet, roof and rear end. 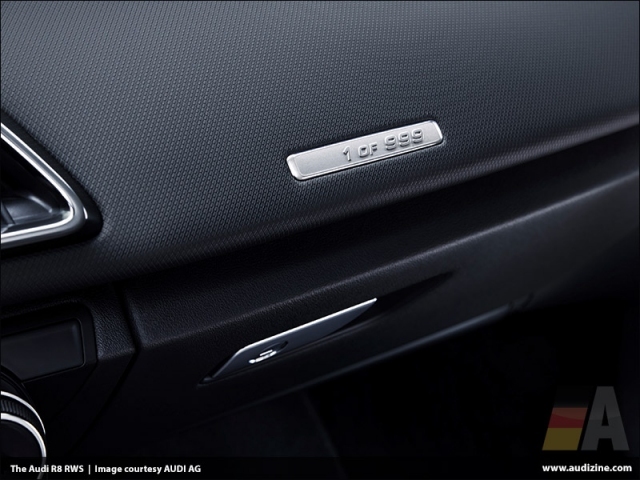 Inside, the driver and passenger sit in sport seats covered in leather and Alcantara. 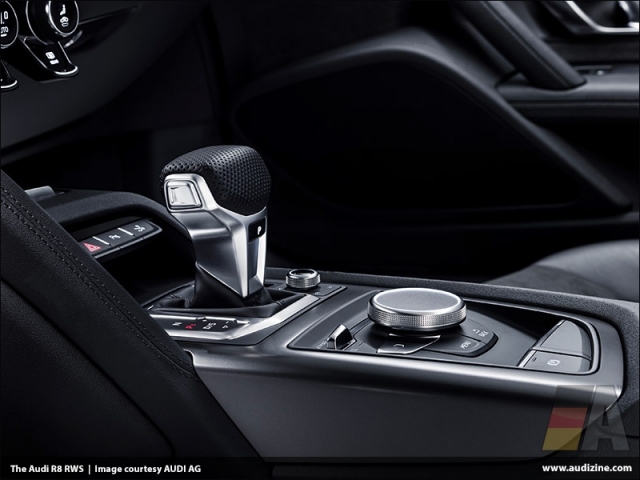 Bucket seats are available as an option. 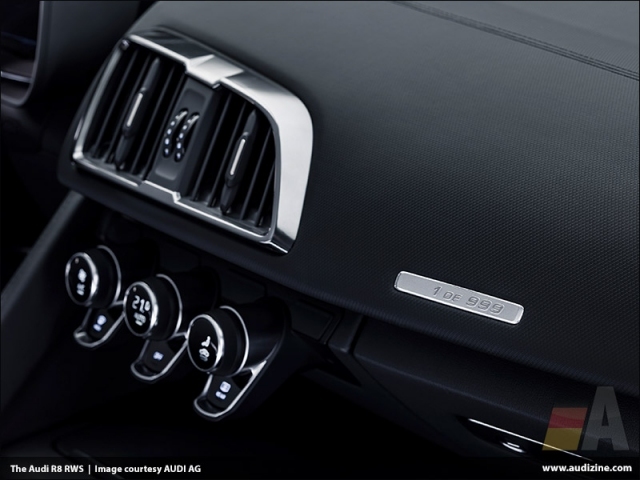 The dashboard bears an emblem "1 of 999," indicating the limited number of units. 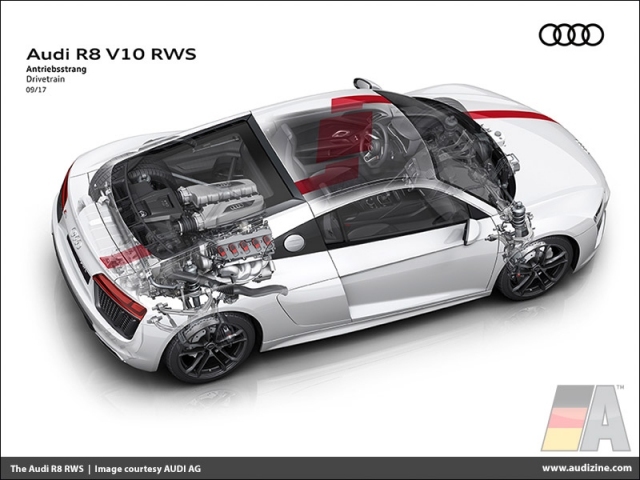 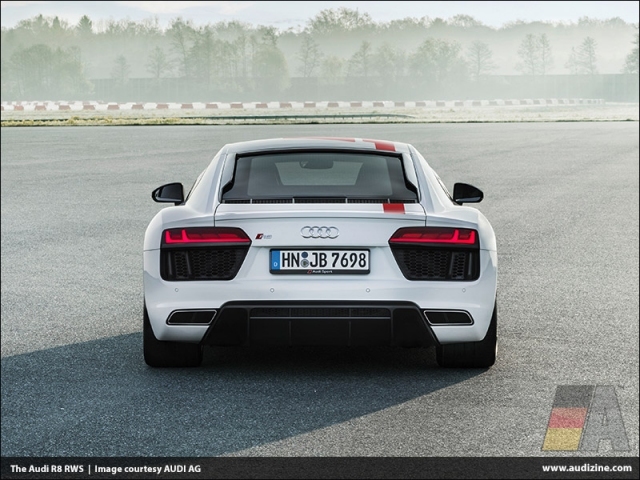 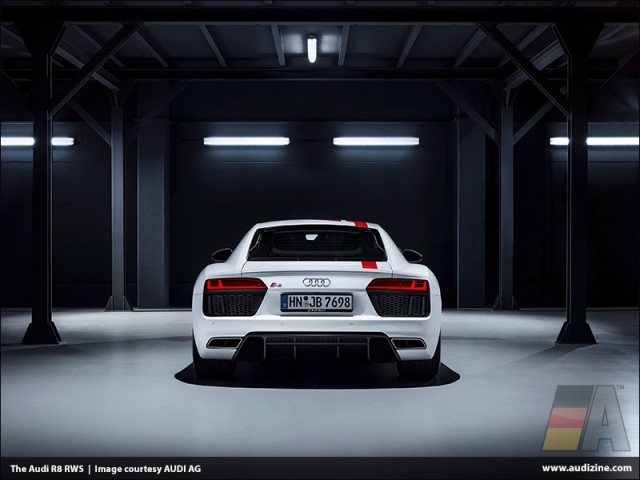 The mid-mounted V10 engine of the Audi R8 V10 RWS produces 397 kW (540 hp). 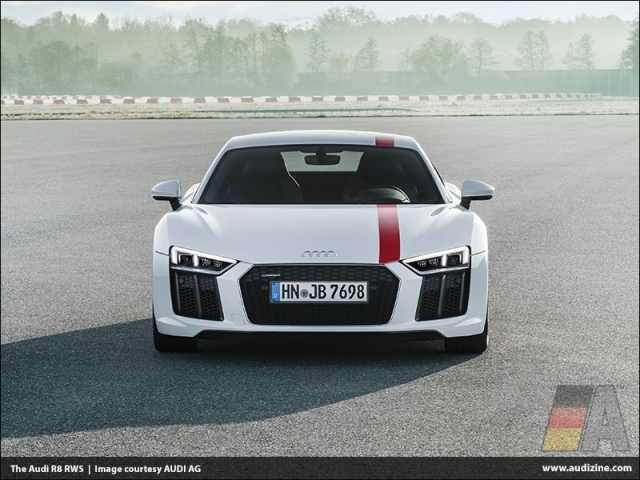 It delivers its peak torque of 540 Nm (398.3 lb-ft) at 6,500 rpm. 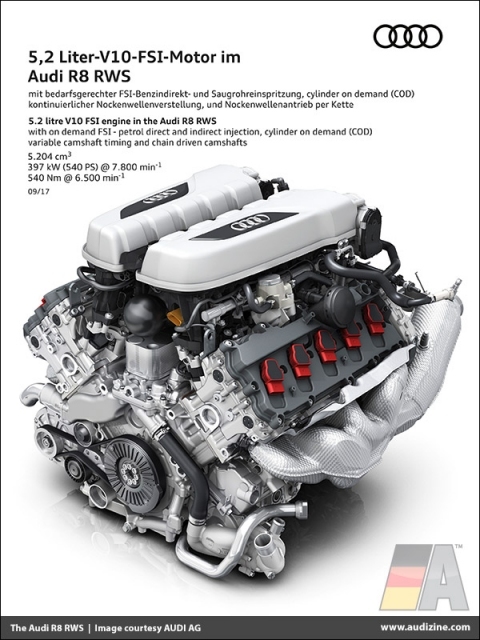 The 5.2 FSI engine accelerates the Coupé from 0 to 100 km/h (0 - 62.1 mph) in 3.7 seconds (Spyder: 3.8 seconds) and beyond to a top speed of 320 km/h (198.8 mph) (Spyder: 318 km/h [197.6 mph]). 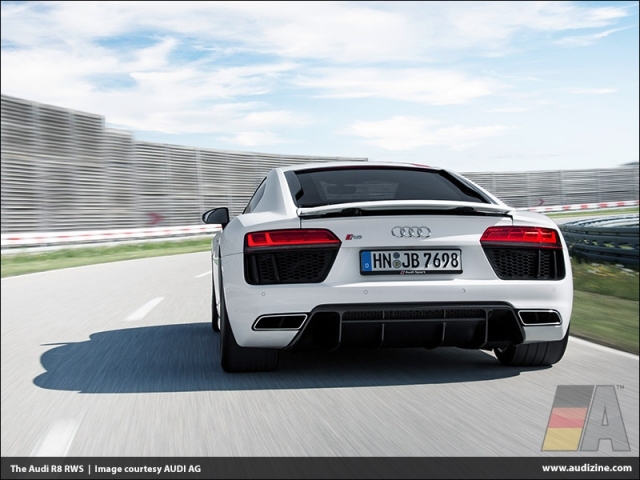 With the top closed, average fuel consumption of the R8 V10 RWS is 12.4 liters per 100 kilometers (19.0 US mpg), corresponding to 283 grams CO2 per kilometer (455.4 g/mi). 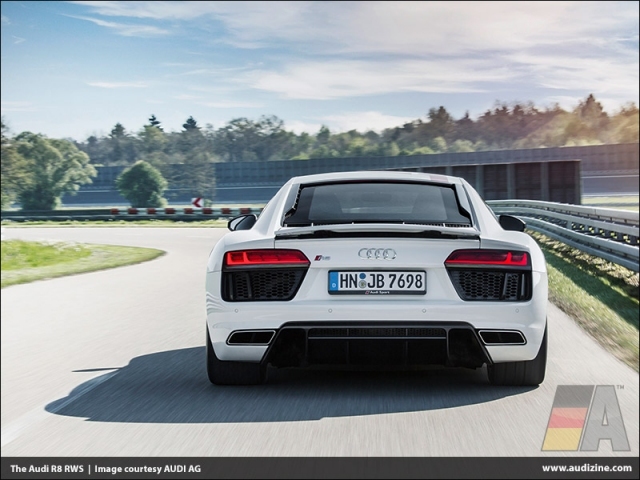 With the top open, these figures are 12.6 liters (18.7 US mpg) and 286 grams CO2 per kilometer (460.3 g/mi). 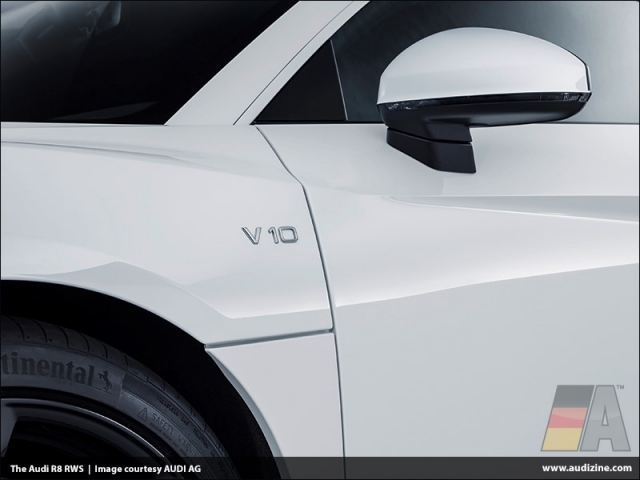 The Coupé weights 1,5090 kilograms (3,505.3 lb) (without driver). 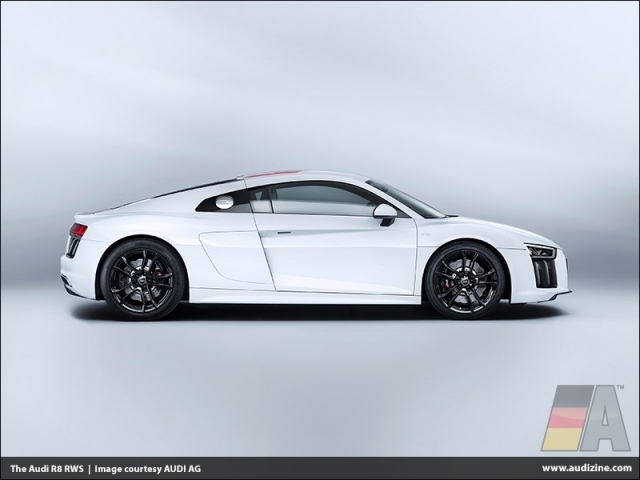 50 kilograms (110.2 lb) less than the R8 Coupé with all-wheel drive which needs additional components like propshaft, multi-plate clutch and center differential. 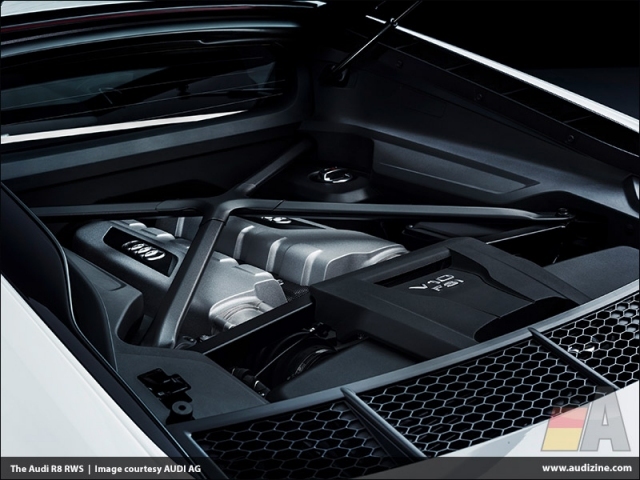 The Spyder is 40 kilograms (88.2 lb) lighter than the R8 Spyder V10, weighing in at 1,680 kilograms (3,703.8 lb) (without driver). 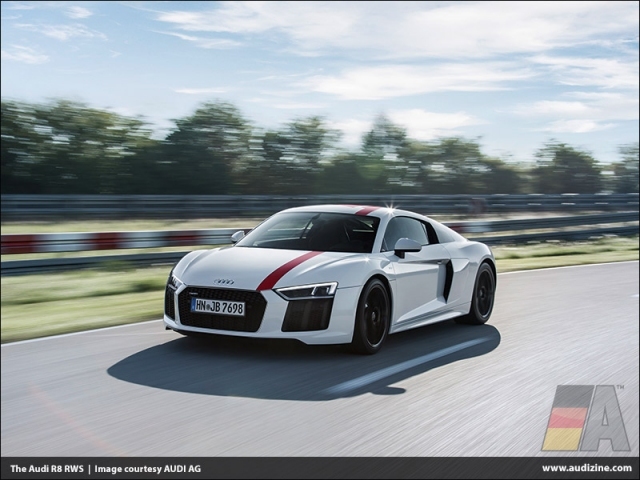 The axle load distribution of 40.6:59.4 (Coupé) and 40.4:59.6 (Spyder) together with chassis and handling tuning specially adapted for rear-wheel drive provide for incredibly fun driving. 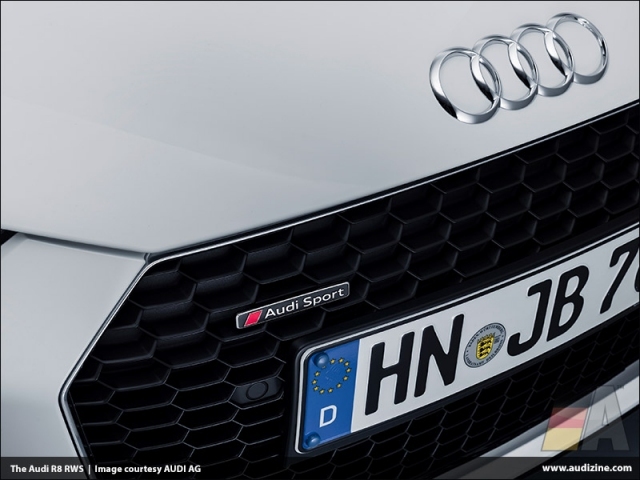 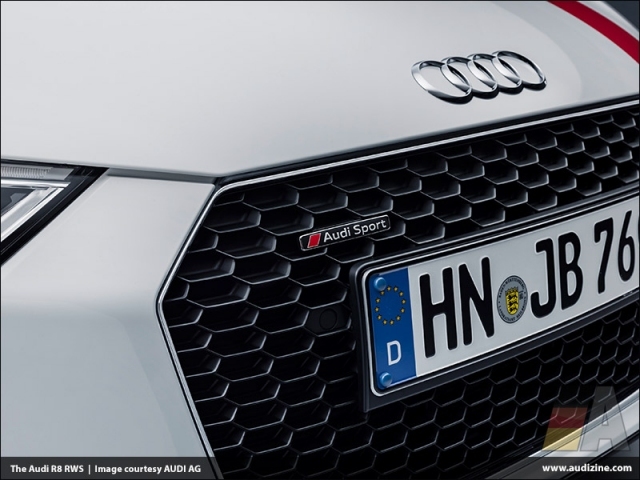 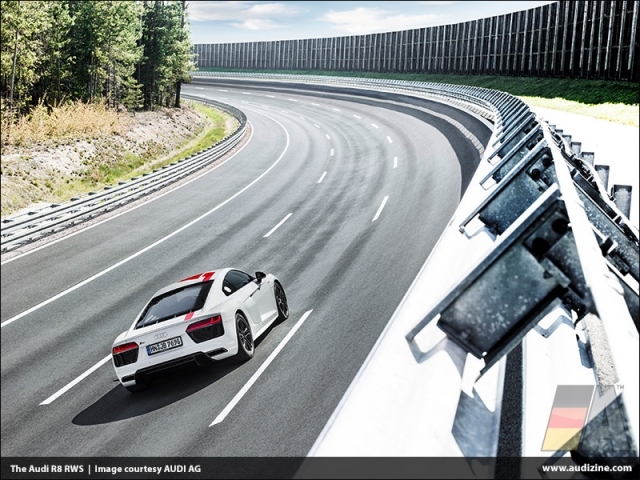 The chassis setup and control systems allow controlled drifts if the driver chooses "dynamic" mode in the standard Audi drive select dynamic handling system and sets the Stabilization Control ESC to "Sport". 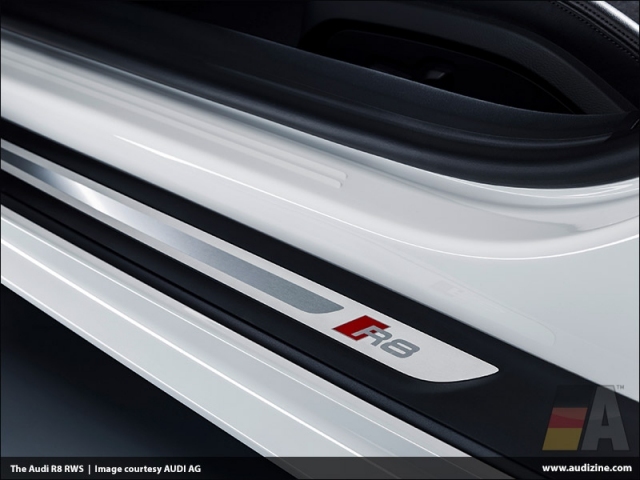 The ESC intervenes reliably at the limit. 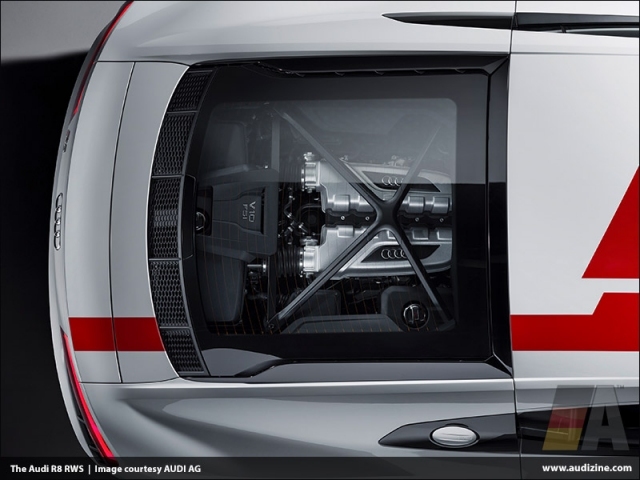 The electromechanical power steering is completely free of torque steer and enables precise handling. 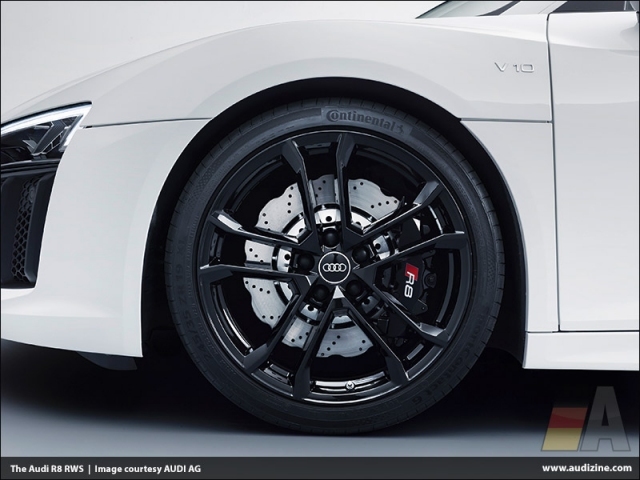 The Audi R8 V10 RWS rolls standard on black-finished, 19-inch, cast aluminum wheels in a five-spoke V-design, with 245/35 tires up front and 295/35 at the rear. 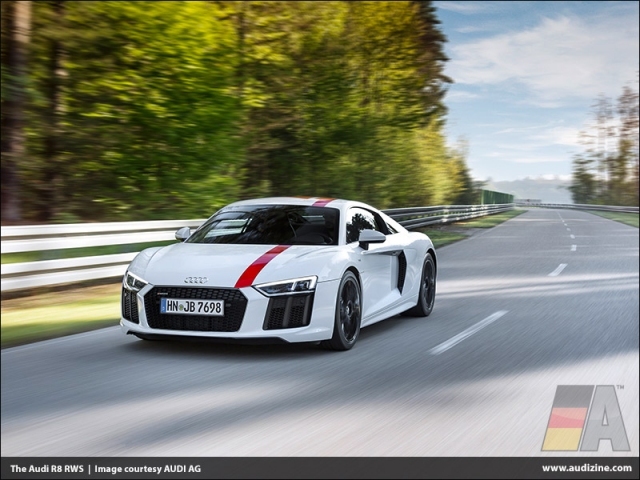 The Audi R8 V10 RWS will be available for order in Germany and other european countries from autumn 2017, and from the beginning of 2018 the first units will hit the streets.The Coupé starts at 140,000 euros, the Spyder at 153,000 euros. 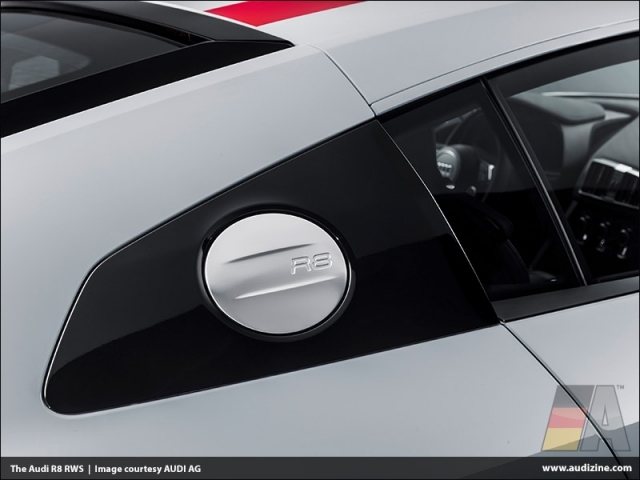 **Figures depend on the body variant.